Dye sublimation heat transfer for ceramic wall tiles, textiles, glass, aluminum, T-shirts, coffee mugs, even floor tiles. Dye sublimation heat transfer for tiles, textiles, glass, ceramics, T-shirts, coffee mugs, even floor tiles. You can do dye sublimation heat transfer onto ceramic tiles and other ceramics, glass, wood, floor covering (flooring squares even rugs). Coffee mugs, mouse pads, and T-shirts are other popular items. 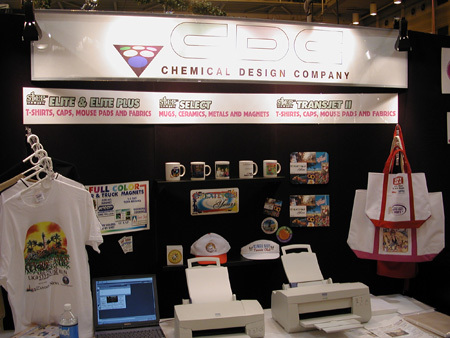 CDC booth at SGAI 2001. Four of the leading large format printers can be outfitted to handle dye sublimation inks. You have to use these special dye sub inks. As a result several of the more popular printers are inappropriate because they don't take aftermarket inks of any kind. With the proper printer and inks you can decorate skis, skateboards, snowboards, helmets, gaming tables, table tops, tote bags, and even special material which you can have coated. Just realize that this is dye-based ink, not pigmented ink, so longevity outside in the sun is not forever. But for reasonable longevity, inside, you can get gorgeous results with dye sublimation on wide-format inkjet printers after you use a heat press. 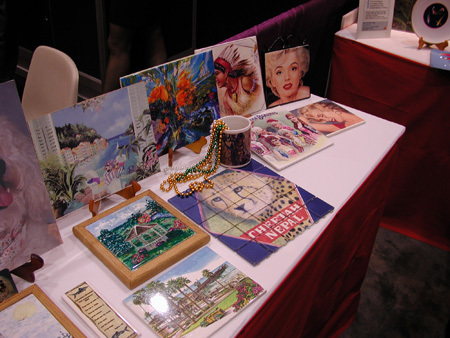 ColorFactory dye sublimation printing examples, at SGAI 2001. 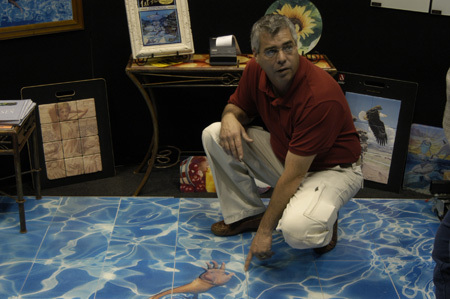 Bison Coating dye sublimation, tiles printing examples, NBM 2004. We are still updating our web pages and FLAAR Reports on all aspects of dye sublimation during 2009. Which printers are best for dye-sublimation on heat transfer paper? Mimaki? There are two kinds of dye sublimation printer for textiles: direct to fabric which use disperse dye sublimation ink and do the sublimation inside the printer (lower down or in front). The second kind of dye sublimation involves printing on transfer paper with dye sublimation ink. You then move the printed paper to a calendering machine and sublimate onto the polyester fabric there. The printer that is most common for printing on dye sublimation transfer paper is a Mimaki JV22, JV33 or others. Be a bit wary of the Mimaki JV5 unless you can find someone you trust who says it has been improved and actually works really well (its issues were mainly with solvent inks so with dye sub may not be as iffy, but one OEM manufacturer told me he gave up on a JV5 and switched to the more reliable Mimaki JV33). Mutoh, Seiko, Roland and others make printers for handling dye sublimation transfer paper, but the ones I see the most are the Mimaki, especially the older JV22 (though this is a venerable printer and the newer models may be better in some respects). At some point, when testing these printers becomes realistic (which means when we have a research project funding), we will comment on which brand and models are best for you to consider buying. Seven years ago the brand of heat presses that I noticed were the Astechnologies rotary heat-transfer press or Rollo heat transfer calendering machine. Today (in 2009) DigiHeat would be a more modern solution to take care of transferring the image from the wide format printer output to the object you wish to decorate. To press onto the round surface of a coffee mug, for example you would select a heat press from George Knight or Hix. Most recently updated Feb. 11, 2009. Previously updated July 11, 2001.